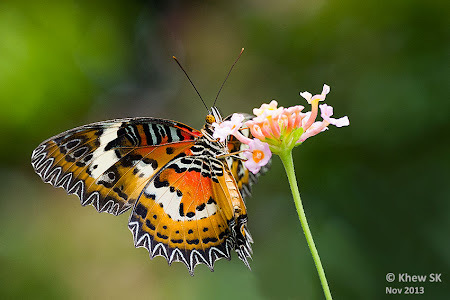 The Malay Lacewing is one of three species of the genus Cethosia that occurs in Singapore. One of the species, the Plain Lacewing, was last seen in Singapore in the late 1990's and has not been seen since. The other, the Leopard Lacewing, a "foreign talent" species, is considered relatively common now, after being first spotted in Singapore some time in 2005. The Malay Lacewing is essentially a forest-dependent butterfly, although there have been sporadic sightings of it in urban parks, even at the Singapore Botanic Gardens. The common name Lacewing was probably coined for the intricate patterns on the underside of the wings of this butterfly, which features pretty patterns on a ground colour of orange and red. The life history of the Malay Lacewing has been recorded on Adenia macrophylla var. singaporeana a member of the Passifloraceae family. This female, feeding on the flowers of Lantana, was shot last weekend at Pulau Ubin.